I use the term 'work' lightly... the van's temporary home is a patch of grass at the in-laws, it's cover from the summer rains a spider-infested tarp, and Adam's workshop a trestle table and an extension chord. But we make hay while the sun shines and rip into the ol' girl. Within days, what was once the caravan's compact kit of beds, kitchen and couches is now a tired, nostalgic pile of 1960's plywood and vinyl. 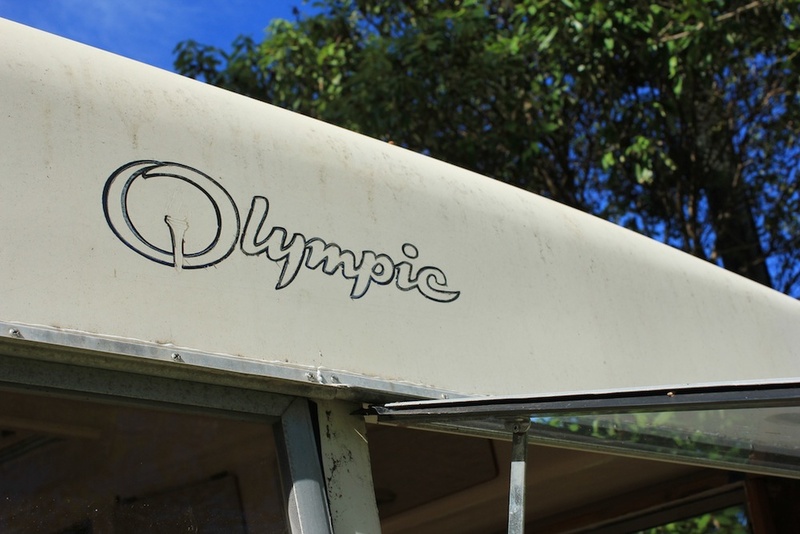 It's hard not to feel a little sad, knowing that the van's days of camping and tramping are over, but we're committed to keeping the caravaning spirit alive as we restore it for a new and even more exciting purpose. Within hours of gutting her down to an empty shell, it becomes pretty clear to Adam that he's got a challenge on his hands: Formed fibreglass and straight edges are not friends, and before we even think about installing fridges, sinks and slushie machines, we need to add a sh*tload of strength to a relatively flimsy body, without adding weight. He measured, sketched, measured, head-scratched, measured again. We started to understand why foodtrucks are big ugly metal boxes. We drank some cold beer. And then just as we thought we'd figured it out, the cyclone came. And then it rained. For 40. days. straight.